You can look forever, but you won't find pancakes with more protein. 6x more protein than standard pancake mixes, with 4x fewer carbs. 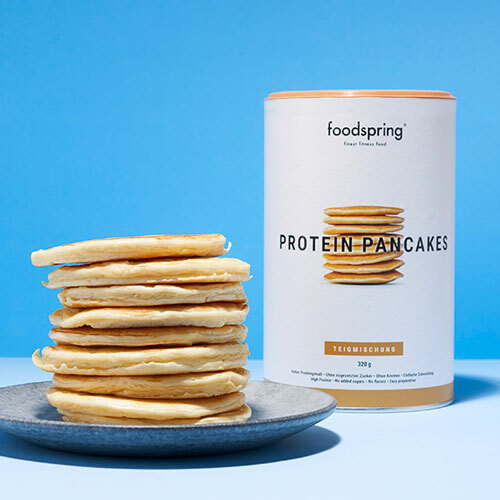 Instead of added sugar and artificial flavors, we added whey protein from grass-fed milk to our pancakes. Just add water and mix in a bowl or a shaker. Easy to portion. Golden-brown and perfectly cooked in under 5 minutes. Shaken or stirred. Fresh from the pan in under 5 minutes. 1. For around 4 pancakes, take 80g pancake mix (approx. 8 tablespoons) and place in a bowl or shaker. Add 150ml cold water. 2. Mix with a whisk or shake well in a shaker with a sieve until the batter is smooth. 3. Ladle the batter into a greased, hot pan or pour straight from the shaker. We recommend using coconut oil instead of butter. 4. As soon as the pancakes are golden on both sides, eat them hot with your favorite toppings. Perfect pancakes without a recipe. No bits of eggshell in the batter. No headaches. We put the perfect blend of deliciousness and protein into the packet. Just add water and they're ready in no time. For soft, thick pancakes. Fluffy and golden. Just a little bit naughty, but without the guilty conscience. We amped up the protein content and cut down on the carbohydrates for these pancakes. Other mixes use white flour and sugar, but our pancakes contain spelt flour and 62% protein. And that protein comes from whey and milk protein from grass-fed cows, plus egg protein from free-range hens. We have really amped up the protein content of our pancakes, and cut down on the carbohydrates. Other baking mixes use white flour and sugar, but our pancakes contain spelt flour and 62% protein. And that comes from whey and milk protein from pasture-raised cows, plus egg protein from free-range hens. Sweet or savory. Pancakes just the way you like them. Dry mixture for making Protein Pancakes. * Calories and nutritional values will differ when mix is combined with a liquid other than water. May contain traces of soy and sesame seeds. Mix the batter according to the packet directions. Heat ½ tsp oil in a pan and make around three pancakes of similar size. Add the rest of the oil to the same pan and fry an egg. Season with salt and pepper. Layer the ingredients between the pancakes and enjoy. Heat up the fruit and then let it cool. Place in a blender with the chia seeds and puree. Leave to cool in the fridge overnight. Cook your pancakes according to instructions and garnish with half the homemade jam. Top with fresh berries according to taste and enjoy. Mix the batter according to directions. Heat ½ tsp oil in a pan and make around three Protein Pancakes of similar size. Fry the bacon until crispy. You don't need to add extra oil. Not sure if I'm convinced about this. Taste-wise are good, but I can't get them looking full and fluffy. I tried different ways but always end up having flat pancakes :( I might just finish the box and go back to my regular recipe. Mein absoluter Favorit für das Frühstück am Wochenende! Ich esse sie am liebsten mit Protein Haselnuss Creme. Damit sie nicht trocken werden mit mehr Wasser, als auf der Packung angegeben, anmischen. Sie sind geschmacklich neutral, da kein Zucker oder andere Zusatzstoffe zugesetzt sind, was ich gerade sehr gut finde. Viele Protein Pancake Mischungen enthalten Glukosesirup o.Ä. Das muss nicht sein! How have you managed to create a mix that makes perfect, fluffy pancakes every time? Our nutritionists, food technicians and athletes tested and retested the recipe until they found the formula for the perfect baking mix. Other protein recipes are often tough and dry, but our pancakes are really fluffy. This is because of our clever combination of spelt flour, whey and milk protein from pasture-raised milk plus egg protein from free-range hens. How many pancakes can I make with one packet? Our pancakes are very different from crepes. They taste best when they are thick and golden. This gives you something to really get your teeth into first thing in the morning. You will get 16 thick Protein Pancakes from one packet. If you like your pancakes thinner, you will obviously get more. Why are your Protein Pancakes so much better than standard baking mixes? It’s simple: Other baking mixes have a tonne of added sugar. We have turned this formula on its head: 0% added sugar and 62% protein. Just as delicious, and just as simple and quick to prepare. Why can't I just make my pancakes out of whey protein? You can, of course. But we want to make it even simpler for you: Place the Protein Pancakes mix to your shaker, add the water, shake, and pour into the pan. It couldn't be quicker. And we have taken great care in choosing all our ingredients and testing our recipes, so the pancakes you make with our baking mix will be as fluffy and soft as standard pancakes would be. Just mix with water? How does that work? It works. That's because our baking mix contains everything you need for perfect pancakes: spelt flour, milk protein and egg protein. Do you want to make Protein Pancakes the way you like them? Go for it: Try them with milk or your favourite milk alternative instead of water. Protein Pancakes will be back in stock shortly.